Big companies today face huge challenges when it comes to being innovative. But change is inevitable and they must find ways to drive transformation swiftly - or risk becoming irrelevant. 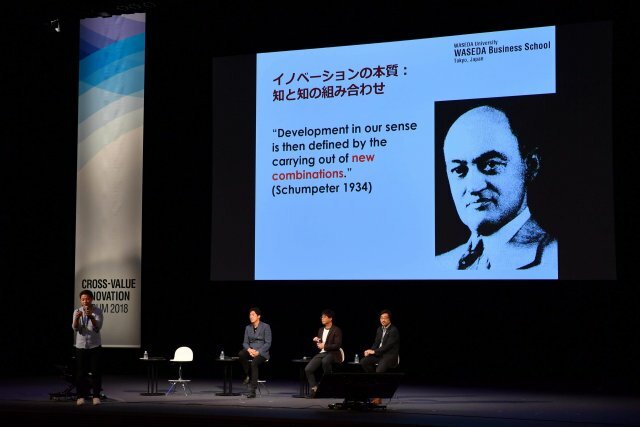 This was the major challenge Akie Iriyama, Associate Professor of Japan's Waseda Business School, laid out in his introduction at a panel discussion held at the Tokyo International Forum on the occasion of Panasonic's Centennial celebration. Joining Iriyama were three game changers making their mark in their companies: Masanori Fukata, Game Changer Catapult, Appliances Company, Panasonic; Toshiyuki Hata, Group Manager, Marketing Division, Yamaha Corporation; and Jumpei Hioki, Founder and CEO, LeapsIn, Inc., a venture from Kirin - all of whom comprise the "guerillas" in Japan fighting for new ways of doing business. Freedom is fuel for thinking outside of the box and the three guerillas shared their own unique takes on how large companies can provide that to employees. Hioki related his own story about how he was given the flexibility to attend events that are not traditionally associated with the norms of productivity and efficiency. "I could attend art exhibitions and startup events like Slush to get new ideas," he said. Iriyama categorizes these initiatives as "knowledge exploration" activities, essential to innovation but whose value is not immediately evident. He highlighted that many decision-makers tend to measure a project's success by efficiency and immediate results, which discourages development of new projects that may not show results in the short-term. Meanwhile, Panasonic's Fukata and Yamaha's Hata noted how their organizations are encouraging employees to carve out a percentage of their working hours to pursue things that make them curious. However, they noted that there will be members of management that will be resistant to such change. To deal with this, all three game-changers emphasized the value of open communication with managers ambivalent about new ways of doing business. Yamaha's Hata described the difficulties in generating original thoughts in the early phases of the "Value Amplifier," Yamaha's own innovation accelerator program. "When we asked employees to submit their suggestions, we discovered that many of them turned out to be the same. They experienced the same problems and came up with similar solutions," he said. Panasonic's Fukata described his own approach during his presentation. Fukata pioneered the "Game Changer Catapult" program within the company, which encourages staff from all levels of the organization - especially rank and file employees - to help drive the company's future into new business areas. "We must shift from a mindset of merely accumulating experiences to acquiring new abilities," he said. "This means we have to unlearn old ways of doing things in order to learn new ones. With Game Changer Catapult, we start by 'learning from the edge' and not from the core." This entails inducing program participants to reach out to actual customers to solve real problems, as opposed to solely holding internal discussions with managers. Connecting with customers - both existing and potential - can generate great results. A few Game Changer Catapult projects - including the automated meal-making device OniRobot - were showcased at South by Southwest 2018 in the United States. The event provided valuable feedback from beyond Japan. These insights from markets overseas can be used to improve existing projects and products from Panasonic, forming a virtuous cycle of enhancement based on partnership with customers - one of the themes Panasonic President Kazuhiro Tsuga touched on in his keynote speech that kicked off the Cross-Value Innovation Forum. Effective partnership that drives innovation can originate from other parties, as well. Hata described how Yamaha reaches out to artistic talent through the YouFab Global Creative Awards, where Yamaha selects outstanding works from creative minds around the world and supports these artists with funding and staff assistance. Fukata also touched on how Panasonic is partnering with Scrum Ventures, a San Francisco venture capital company, to create BeeEdge, which supports open innovation on appliances. The journey to innovation can take many forms. Hioki at LeapsIn started out his career as an employee at Kirin and then decided to go out of his way to transform the company's food business ecosystem. His current company, a venture with Kirin, offers one-stop total support for processes such as conception, design, quality evaluation, mass production, production management, and project management of food products. Hioki believes that moving outside of the original business entity has its advantages. "The idea of synergy is thrown around a lot in business communications for innovation," he said. "But at times, there is the concern of cannibalizing the existing core operations. Stepping outside has provided me - as well as my team - the freedom to explore new methods while still being able to benefit Kirin through the partnership," he explained. Near the end of the session, Hata described the innovation experience as "skydiving with a half-formed parachute." The risk of standing still, on the other hand, is even greater. Fukata warned, "If we do not adapt, Panasonic might not have another 100 years to celebrate." By unlearning old ways, creating new value with partnerships, and stepping outside of comfort zones, large companies stand a better chance of remaining relevant. [Press Kits] 100th Anniversary "CROSS-VALUE INNOVATION FORUM 2018"